The Russian Admiral Grigorovich reached the Syrian coast Tuesday evening, RT reported. The frigate departed a Sevastopol, Crimea, port to join the Russian fleet stationed in the Mediterranean Sea, according to the Russian Ministry of Defense. The frigate was deployed in November 2016 to launch Kalibr cruise missiles on terror cells operating within Syrian borders. 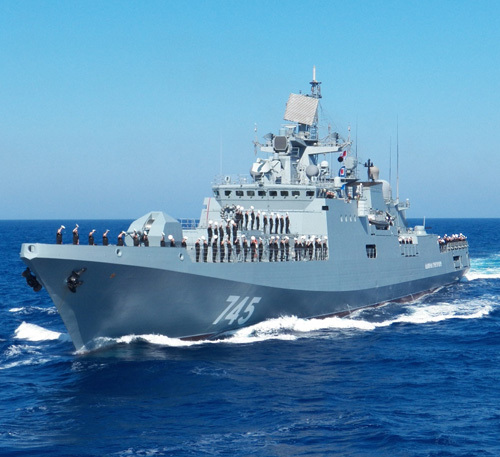 “Under the plan of combat training, the cutting-edge frigate Admiral Grigorovich has left Sevastopol and set a course for the Black Sea straits, connecting the Black Sea with the Mediterranean Sea,” Russian Navy Captain 1st-Class Vyacheslav Trukhachyov said. “The military vessel, under the command of Captain 3rd-Class Anatoly Velichko, has embarked on its third long-distance mission,” Trukhachyov added, since first being commissioned on March 16, 2016. The mission objective of the Admiral Grigorovich will be to join and “carry out tasks as part of the Russian Navy’s permanent task force in the Mediterranean,” Trukhachyov said. The Commander did not specify the exact role the frigate would play in Syrian operations. The Kremlin plans to scale back its naval presence near Syria per orders from Russian President Vladimir Putin. This decision prompted the return of the Russian aircraft carrier Admiral Kuznetsov and the nuclear-powered missile cruiser Peter the Great to the main northern Russian Navy base, Severomorsk, early February.